Which Theology Is Right, Reformed Theology or Arminianism? For the most part, when you step into a church they have many foundational beliefs in common when it comes to how to attain salvation. Beyond that point is where many churches differ. Many churches start out with the same beliefs taught in the Bible, but over time have strayed into adopting beliefs that are clearly contrary to the Bible. In Christian circles, two groups of churches that differ from one another are those who have adopted Reformed Theology, or Calvinism, and those who have adopted Arminian theology, sometimes called Methodism. On the surface, both believe the same thing when it comes to the need to trust Christ as their Savior for salvation, but beyond that is where the differences become stark in comparison. How do we know then, which theology is right, Reformed Theology or Arminianism? As always, the Bible provides the answer. Are differences in theology new? It is no secret that many churches have clearly apostatized from the truth of Scripture. A few years ago I saw a sign outside a notoriously liberal church entitled, “The compassion of abortion.” Not long after, I had the opportunity at a funeral to speak with someone who attended that church and I asked her if she was at the service when that message was delivered. With enthusiasm and assuming that I shared her views, she breathlessly praised her pastor as a woman who really speaks to her and guides her when it comes to women’s issues. She continued by telling me all the same old tired arguments for abortion like ending the enslaving of women, child abuse, and delivering a child from a life of poverty. I asked if since the U.S. Supreme Court decreed abortion to be a right if it has accomplished what it was supposed to do? Her response floored me when she said, “Not yet, there is much more work to do.” Unfortunately, we were unable to continue the conversation, but I wondered if over 50 million abortions did not solve the problems it was argued to solve, how many more children must die before this act of compassion had any effect? Sadly, this is a common occurrence when it comes to differing beliefs. People stop following the teachings of Christ and start following the teachings of someone else. This is not something new. The Bible describes numerous times when people either did not know or strayed from the truth to follow the teachings of a person (Exodus 32; Judges 2:1-15; Acts 15; Acts 19:1-7; 1 Corinthians 1:9-17; 2 Corinthians 11:1-4). Likewise, the Apostle John described seven specific churches by name in the book of Revelation that had differing beliefs: Ephesus, Smyrna, Pergamos, Thyatira, Sardis, Philadelphia, and Laodicea. Only one, Philadelphia, did God not mention that He had anything against (Revelation 3:7-13). Yet, all of the churches were described as having amongst them those that overcome, which is a reference to being saved (1 John 5:1-5). It is no different today, many churches subscribe to theologies not totally in line with Scripture, yet there are still people in those churches that are overcomers in Christ. 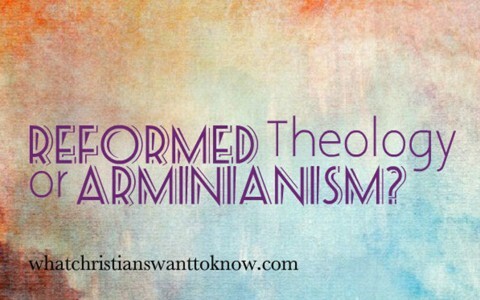 What is the difference between Reformed Theology and Arminianism? When it comes to the issue of salvation, both believe that salvation comes by God’s grace through faith apart from any works we may perform, no matter how good. However, there is a difference in the interpretation of Ephesians 2:8-9, “For by grace are ye saved through faith; and that not of yourselves: it is the gift of God: Not of works, lest any man should boast.” The difference between these two groups is based on the identity of what “is the gift of God.” For the Calvinist, the gift of God is the faith needed for salvation. For the Arminian, it is salvation that God gives through our faith. I have had many students diagram this verse to see what is referred to as “the gift of God” and it becomes quite clear. When diagramming this verse, the dependent clause, “that not of yourselves,” refers to something in the previous clause “For by grace are ye saved through faith”. We see that each noun in this previous clause, grace and faith, are part of prepositional phrases referring to salvation. These prepositional phrases, “For by grace” and “through faith” are directly describing how “are ye saved.” This is reinforced by the other three clauses: “It is the gift of God”, “Not of works”, and “Lest any man should boast. To believe otherwise would be saying that “not of works” is not referring to salvation, which goes against everything the Bible teaches about salvation! Likewise, faith comes by hearing and hearing by the Word of God (Romans 10:17). Much more can be added, such as the fact that the nouns grace and faith are linguistically feminine in gender and the verb “saved” is not feminine. Likewise, the word “that”, used in the phrase “that not of yourselves” is not feminine. Since it is not feminine, it is not referring to a feminine object such as faith or grace. “That” can only be referring to salvation. This is in keeping with noun verb gender agreement in every language that uses it. When it comes to the issue of eternal security, both believe in the concept of being eternally saved. However, Arminians place a condition on eternal security and Calvinists believe that if a person is truly saved, they are eternally secure in their salvation. For the Arminian, a person is saved by grace through faith, but can lose their salvation by works or give it up by choice. They use several verses out of context to come to this conclusion. I have asked several who hold this belief what would cause them to lose their salvation and the response is consistently based on the believer falling into some sort of sinful lifestyle like adultery or drunkenness. When further pressed about lesser-perceived types of sins like telling a lie or an episode of unrighteous anger typically the response is that it probably would not result in a loss of salvation. This demonstrates a classic belief in mortal sins and venial sins common to Catholicism. When pressed on how a person gets their salvation back if they commit adultery or fall into drunkenness, the response is typically that the person must repent and stop committing adultery. Logically speaking, this suggests that salvation is by grace through faith the first time, but then after, it is by repentance and good works? God forbid! To demonstrate this truth, I have asked people who make this claim that if what they are saying is true, then how many times a day did the Apostle Paul lose his salvation and get it back as the chief of sinners (Romans 7:14-25; 1 Timothy 1:15)? It is quite obvious in the light of Scripture that if we cannot earn our salvation by good works, what makes us think we have the power or are good enough to keep it or throw it away (Ecclesiastes 8:8; Ephesians 1:12-14; Ephesians 4:30; Hebrews 10:39; 1 Peter 1:3-9)? Furthermore, what gives us the right to tell the Lord that although He purchased us with His blood, we do not belong to Him anymore (Acts 20:27-28; 1 Corinthians 6:19-20; 1 Corinthians 7:23; 2 Peter 2:1)? If we are born again, how do we get unborn again? Do we become born again every time we get resaved? Likewise, if we become a child of God by faith in Christ, do we stop being a child of God every time we lose our salvation (Galatians 3:26)? And, if this is so, do we stop being children of Abraham by faith and heirs to the promises that God made to him (Galatians 3:6-16)? Or, are we not sealed by the Holy Spirit of promise until the day of redemption, which is our non-refundable guarantee on our inheritance (Ephesians 1:12-14; Ephesians 4:30)? It is clear that this leads to so many questions that one could never have the assurance and peace that comes from knowing that God will never forsake them or leave them; that no man, including ourselves, can pluck us out of God’s hands (Ecclesiastes 8:8; John 10:28-29; Hebrews 13:5; 1 John 5:13). This leads to nothing but confusion. There are many more comparisons that can be made, but it simply comes down to this. God knew in eternity past, who would trust Christ as their Savior and who would not (Romans 8:28-35). He knew that there are some people that no matter what you say or what they go through in life, they will never see the need for a Savior. Therefore, those whom He foreknew would love Him (believe the gospel), God predestined to be conformed to the image of His Son, meaning that God would set in motion the events that are needed so that we would hear the gospel at just the right time on our lives when He knew we would believe it. And, those who believe it will one day stand before God, perfect, conformed to the perfect likeness of His Son Jesus. This is what it means to be of the elect, those chosen by God based on His foreknowledge of who would or would not ever believe the gospel. Then, when we trust Christ, we are grafted into the elect family of Abraham, Israel, and made rightful heirs to His promises (Isaiah 45:4; Isaiah 65:9; Luke 18:7; Romans 11:16-17; Colossians 3:12; 1 Peter 1:2). So, which theology is right? As mentioned earlier, there were seven churches mentioned in the Book of Revelation. Only one was mentioned as God not having anything against, Philadelphia. When answering this question, we must look at how God described the believers in this local church in Scripture (Revelation 3:7-13). They believed that salvation was available to anyone. They believed that their strength was not of themselves, but of the Lord. They focused on learning and keeping God’s Word. And, did not forsake God’s name. As a result, God promised them that He would have others look to them as being holy and loved by God. Because of their patience, He promised them that they would be kept from temptation. Finally, He promised the believers that He would make them a pillar, or a key foundational element in His temple and give them a new name as overcomers. With these things in mind, we must look to God’s Word to sort out differences in any theological construct made of men. When we can do this, then we can fully understand that following the teachings of Christ is never to be compromised by following the theological teachings of man (1 Corinthians 1:10-24). Therefore, we must conclude that only the teachings of Christ are right. Churches have many foundational beliefs in common when it comes to how to attain salvation. Beyond that point is where many churches differ. Differences in theology are not new. Two groups that differ in theology are those who subscribe to Reformed Theology and Arminianism. They agree that salvation is by grace through faith, but differ on how that comes about. Likewise, they differ on Who or whom has the power to keep their salvation which results in confusion on many theological levels. When it comes to disagreements on theology, the teachings of men should never be the focus point of believers. This concept was demonstrated by the church in Philadelphia as mention in the Book of Revelation. When I’ve been presented with the whole “Calvin vs. Arminius” thing, I’ve seen far different issues presented than those you cite here, Dr. Mike. One of the biggest ones is the consequences of predestination or foreknowledge on the gift of salvation. Many conclude that, since God foreknew who would be saved, that there is therefore no free will, and that Christ did *not* die for all, but only for the “elect” (another Calvinist term). Perhaps my favorite answer in dealing with the conflict between the two sides and their supporting Scriptures comes from the late Chuck Smith, who basically said that he didn’t know, but he would teach based on what the Scripture he was teaching on said. Excellent article on this issue, Dr. Williams. However, I have read extensively concerning the ‘biblical support’ for each side of the discussion (Reformed/Arminian) and find that each side can, and does, offer solid biblical exposition for their side. It appears that the focus should be on the things for which both sides agree: living with Jesus Christ as Lord of our lives. That way, we don’t have to be concerned at all with many of the issues this discussion brings up (eternal security, foreknowledge, works, etc.). Thanks again, Dr. Williams. Having said that, I have taught on this subject for years and am always amazed at how many dear saints believe that they will go to hell when they die if they have any un-confessed sin in their lives(Arminius). It is a terrible way to live, IMO. It destroys peace. Yes, it helps them stay in line but at what price? I’ll tell you…with the sword of Damocles hovering over their heads. As the Greeks stated, “Judge no one happy until his life is over”…Does Christ call us to this type of life for the cost of obedience? I hear many countering with, “Well Doc are you suggesting that we can all sin away once saved because our ticket has been purchased?”. I will say with Paul, God forbid(Rom 6:1,2). We live for Christ once saved knowing we will fall, but running back to our only peace, seeking continual repentance from our sin, not because we have suddenly re-merited hell, but because we Love God. This is so important. Wrong teaching on this subject has sent many poor saints to the cupboard for Rolaids and anti-depressants. Many lives are ruined in defeat and misery. What a way to live! Let God be true and all men be liars(Rom 3:4). Arminianism is heresy. I just found your comment. I usually get email notices, but I didn’t this time. Anyway, good to hear from you. I don’t know all that Arminius believed, so I can’t say with any certainty whether or not he was a heretic. However, I am familiar with John Wesley and do believe him to have been a sound theologian. Therefore, let me try to lay out what I believe a bit clearer (so I’m not labeled a heretic LOL). First, I don’t believe that you will go to hell if you’ve lived for Jesus, but die having unconfessed sin in your life. The Bible doesn’t teach that either. If Arminius believed that, he was mistaken (or a heretic). I believe that, by the Holy Spirit’s work of sanctification, we will sin less and less as we grow in our walk with Jesus. I would love to reach a sinless state, but I’m not sure if that is possible or not in this life. Believers should desire to obey Jesus because we realize how much He loves us and we are so very grateful He saved us. If we are living for Him simply to avoid punishment, we might want to reevaluate our walk. Doc, your last paragraph brings up a very important point (concept). The Christian you describe (one who occasionally falls into sin, but repents and returns to following Jesus) is a depiction of one who truly desires to live for God and who is, therefore, saved. Now, a person who DOES NOT repent and return to Christ when he or she sins, would cause one to wonder whether or not they are truly a Christian at all (after all, Jesus says, “If you love me, you will keep my commandments” [John 14:15; see also John 14:21, 23, 15:10; I John 5:3]), but rather, someone who is in rebellion against God. In a nutshell, I believe in the ‘security of the believer’. As long as one believes (a sincere belief, not just mental assent), he or she cannot ‘lose their salvation’. However, if one decides that they do not believe in Jesus Christ anymore, that person is no longer saved. Romans 10:9-10 say “…that if you confess with your mouth Jesus as Lord, and believe in your heart that God raised Him from the dead, you will be saved; for with the heart a person believes, resulting in righteousness, and with the mouth he confesses, resulting in salvation” (Romans 10:9-10). If someone is doing this…they are saved. If they are not doing this, or they cease to do it, they are not saved. It is not simply falling into sin which results in someone ‘losing their salvation’; it is a rejection of the offer of salvation, a rejection of Jesus Christ (a blaspheming of the Holy Spirit, if you will) that results in a ‘loss of salvation’. Now, some say that these people, who no longer appear to be saved, never were saved in the first place…that is a topic for another time. This is a subject which has adherents on both sides presenting biblical evidence for their side…I don’t think it will be settled this side of Heaven…thus my comment about focusing on Jesus Christ instead. However, I do appreciate people like you Doc, who will engage in a serious discussion and who force me to think long and hard about what I believe and why. God bless you and I look forward to hearing from you. I seem to be having difficulty posting but am going to try again. Hopefully it will not be a duplicate post. I first heard the doctrine of sovereign election 10 or more years ago there were many things that stood out to me as being quite dynamic. I added below some scripture verses using the Amplified bible in the hope of clarification. One dynamic is that after I received in my spirit and agreed with the doctrine of predestination/election I began to see it literally leap out at me from the pages of the whole bible. Some don’t see it is because in many churches Arminian teachings becomes embedded in their minds for many years. They find that the bible is confusing and are unsure about what they are reading and subconsciously think why can’t I understand this? When I understood that salvation was ALL a gift and ALL of grace an important thing happened. I no longer was in fear of losing my salvation that God needed to be appeased because it was the Father who planned for my salvation and He sent His Son Jesus to die and take away ALL my sins past present and future. Here’s another dynamic. When you finally believe you are eternally and completely forgiven your motivation for serving Him becomes pure. You are not serving Him out of fear of losing your salvation or some other sense of appeasement but out of love and gratitude. NOW you can see clearly. Now the Holy Spirit can work in you freely and not motivated by fear in our flesh but in confidence in Christ our Savior. 12 So that we who first hoped in Christ [who first put our confidence in Him have been destined and appointed to] live for the praise of His glory! I agree with you Robert that this is such a vast topic with adherents on both sides. I was torn on the subject for the majority of my Christian walk. I found my peace with the argument in the following manner. I hope this might help others reading who are struggling with the seeming conflict between the two sides. What actually happens when we are born again or saved? This quote of yours Robert is at the heart of the confusion, “…for with the heart a person believes, resulting in righteousness, and with the mouth he confesses, resulting in salvation” (Romans 10:9-10). I often thought this way, but then I stepped back and thought about the whole process of what you describe as, “If someone is doing this…they are saved. If they are not doing this, or they cease to do it, they are not saved.” This, IMO, confuses the function of Faith vs Grace. Is it our faith that saves us, or God’s Grace? Do I need to gin up my faith each day to make myself, in Derek’s words, “worthy” to continue my salvation or is salvation an independent trans-formative, one time action of the Holy Spirit plunging me through the waters of Holy Spirit baptism and causing me to become born again? Our spirits, as Rick quoted, then bearing witness with God’s Spirit that we are now the children of God. This does not require any continuing work of faith on our part. We “believed” and it was credited us as Christ’s Righteousness. Not our righteousness but Christ’s, not my faith but His Grace. Can we become un-born, once “born again” by God’s Spirit? You say yes, no? Ok lets go there. I here Arminius saying, “what about all of those verses that say we must labor on, with persistence and perseverance etc if we are to receive our rewards as spoken of in Revelation and elsewhere in Scripture”. Those are the rewards that the believer will receive for his good works. It is not speaking about salvation. Some will not get any rewards at all but they will still be saved(1 Cor 3:15). So I agree with you Robert, a supposed Christian who ends up shaking both fists at God, denying Him to his death was no doubt never born again. The church is filled with false converts. My guess is over 50% of most evangelical churches and over 75-90% of mainline Protestant and Catholic churches are filled with false converts. It is terrible. Pentecost must happen in the heart of the person expressing belief in God. It is a sovereign act of God. It is not a 40,000 mile/5 year maintenance warranty program that has the born again believer needing those periodic inspections in order to maintain his warranty(salvation). The true convert will seek repentance and God’s forgiveness when he falls into sin, because the Holy Spirit will bug him to death if he/she is a child of God.. We know these folks by their fruit. It is not their fruit or faith that is saving them or that continues to keep them in a state of Grace(saved). It is God’s Grace that keeps them in a state of faith(trust). It is a wonderful thing, this Grace that God has bestowed upon us. We walk by faith because we are born again by God(His Grace) “Now He who has prepared us for this very thing is God, who also has given us the Spirit as a guarantee. So we are always confident, knowing that while we are at home in the body we are absent from the Lord. For we walk by faith, not by sight”(2 Cor 5: 5-7). Notice that it is God who gave us His Spirit as our Guarantee. It is this act, the next verse says, that gives us confidence or faith. In summary, God is the cause, who sheds His Grace upon us. We respond through faith and the mystery happens…we are transformed or born again. We do not get born again because of our faith, nor do we maintain our salvation through our faith. We get born again, “”BE Cause””(by the cause) of God. Our faith does not save us, Jesus saves us. Therein lies the confusion. Hopefully this helps someone out there. We could go round and round with this disussion, and there is nothing wrong with that, but we would probably end up with you holding your viewpoint and me holding to mine…both which we are sure are biblical (maybe parts of both are and it is us who can’t quite get it right). Anyway, as usual, a great discussion with you and I know I have a brother in Christ in you…I also value these conversations very much. I will leave you, and others who might read our comments, with this. If we make it our goal to “…love the Lord your God with all your heart, and with all your soul, and with all your strength, and with all your mind; and your neighbor as yourself” (Luke 10:27 NASB; Deuteronomy 6:5, 10:12, 11:13, 13:3, 30:6; Matthew 22:37; Mark 12:30) we can rest assured that we are saved and that we are secure in our salvation. God bless you, brother. Its not about whether one should be a Calvinist or Arminian. It’s about what does the word of God teach.